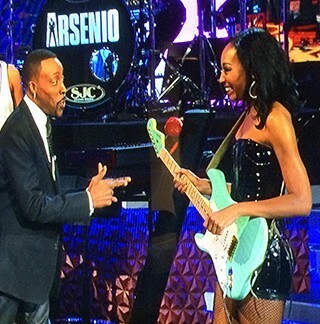 Just over a year ago, SoulTrain.com contributor Starletta Watson profiled left-handed guitar slayer Malina Moye as a SoulTrain.com Sound Check artist…Moye announced earlier this week that she–along with her record label, WCE Records–inked a distribution and marketing deal with BDG-Sony Red. Anyone with an ear to the ground knows that distribution deals and partnerships such as this can be a boon for independent artists, who often find these kinds of arrangements to be more mutually beneficial, profitable, and sustainable than more traditional major label deals. We here at SoulTrain.com are looking forward to hearing Malina Moye’s new music and watching the magic unfold with her new partnership. Check out her video “Rock & Roll Baby” here, and visit her official website malinamoye.com for more information on her latest venture!